On a January afternoon in London, a reader comes upon a translated collection of stories by an almost-forgotten Argentinian woman writer. He realises he doesn’t have his spectacles with him. Nevertheless, he begins to read the book on his way home. He decides he must read her fictions in their original Spanish, which he finally locates in the university library. But he has to travel to a distant place, and when he returns he finds the university is surrounded by strikers and protesters, and he doesn’t want to cross a picket line. This is a trope that might well have appealed to Sara Gallardo, and I wonder how, with her flair for the unexpected turn, she’d have concluded the tale. But it’s actually an account of my own encounter with Gallardo’s stories, and my inability to find them in Spanish in time to write this piece about her work in translation. Well, I think as I sit down to write: I’ve read Tanizaki and Kleist and even the One Thousand and One Nights in translation, so why not Gallardo? And translator Jessica Sequeira has made a fine rendition of this collection, with its several sections loosely linked by theme or motif, and its dazzling switches of narrative mode. Sara Gallardo Drago Mitre was born in Buenos Aires in 1931; she was from a privileged line of landowners and was the statesman Bartolomé Mitre’s great-great-granddaughter. She started publishing in her teens. After the death of her second husband, the poet H. A. Murena, in 1975, she moved to Spain, and, in 1979, wrote her last book, La rosa en el viento. She died in Argentina at the age of fifty-six. 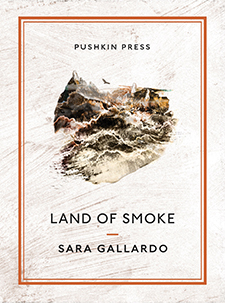 Literary lore tells us that El país del humo (Land of Smoke), the complex and multilayered collection that introduces her for the first time to an anglophone audience, reads as if it were compiled from a lifetime’s work; but, first published in 1977, it is also said to have emerged after the suicide of Gallardo’s husband. Though it bears several signs of loss and mourning, there is almost nothing here of personal overflow: grief is turned into metaphor and is only one of the several aspects of the human (and animal) condition the author evokes: violence, war, massacres; desire, exile, remorse, and, most compellingly, lack of fulfilment and the half-lives so many of us live. It’s clouds themselves, not the mere factors that form them, that act on the collective events of humanity. They combine them, decide them, precipitate them . . . it’s true that clouds result from a combination of factors. At the same time, clouds are more than these factors. They possess an essential energy, they make history. One day he saw the city of Buenos Aires, wrapped in fog. Chimneys as tall as young girls scattered their smoke messages zigzagging into the fog. A smell of putrefaction, and the city with lit-up buildings was waking, coated in pink . . . of course he cried. Along with violence and melancholy there’s humour here as well. In “The Caste of the Sun,” a soothsayer has an enigmatic relationship with her sorrel horse, who provides her with hair from his tail for her blonde wig, and very possibly with good counsel too. An entire section deals with animal stories: cats, rats, and, notably, horses. Among them is a prose poem about a lawn, which is cut down one day to clear the way for a king’s visit. But here, too, there’s an epiphany to be found; the dying grass sings of trains, autumn, ice cream and coffee vendors, children, smoke, and rain, echoes of images from other stories. I gave myself up to mystery. To a land that does not exist. I am faithful. I persevere. But in this story the reader might well feel, after a twenty-page journey, deprived of the conventional satisfactions that parts of the narration, and its Perrault-like title, promise. Similarly, the long tale “Erik Gunnardsen,” embedded in “Daggers,” which announces itself as the book’s most overtly melodramatic section, ends with a shocking death for which the enigmatic, stately pace of the story, which appears like a series of pastel tableaux, does little to prepare us. (I have often heard the same criticism levelled at Lydia Davis.) Such feelings of disorientation may well be what Gallardo deliberately attempts to elicit. But there are times, as in this story, when the reader has the feeling of being lost in a vaguely nightmarish dream that doesn’t quite reveal the reason for its own menace. Such caveats are inevitable, though, in a collection of this length—nearly three hundred pages and almost fifty texts. There are moments when the reader might wish that some of its sections might have been separately published. But it was evidently the author’s intent to create her own variant of a many-voiced ocean of stories in the manner of the ancients, with facets that echo, reflect, and collide with each other. It’s a massively ambitious, and often successful, task. No one is, after all, under compulsion to read the whole book in one go, though each sequence is probably intended to cohere within itself. the heart is like a glass, and that when bitterness fills it to the brim, it overflows in tears. Love burned within her once again. While he was bathing she went for a walk. She looked at the low clouds like the bellies of marvellous birds brooding over the egg-shaped lake. The world revealed itself to her once more.